Speciality coffee roastery from Amsterdam. 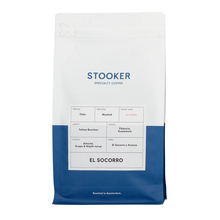 Stooker is a perfect match for those looking for light and medium roasts for pour-over brewing methods and espresso. Their close relationships with farmers and importers give them full control over the production. 250 g Brasil Ethiopia Guatemala Kenya Whole bean 100% Arabica Natural Semi-washed Washed light Pour over (Alternative brewing methods) Sort by: Price (Low to High) Price (High to Low) Product name a - z Product name z - a Highest rate Lowest rate New in!